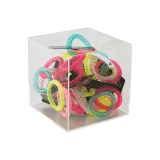 A Wooden Display Cube Set is a simple yet innovative way of effectively making sure your products are visible to your customers. Whether you're decorating your window display or adding more ranges in store, cubes are a must-have merchandising accessory. What are the cubes made of? The cubes are made of wood and come in a natural finish to suit any decor. The cubes have smooth dove-tailed corner joints which are strong and resistant. The cubes do not have a back, so everyone will be able to clearly see an item on display from the front and back. Can the cubes be stored away? 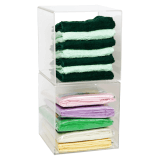 Yes, each display box is a different size which means they can be either stacked or nested away neatly to save space when they are not being used. Alternately you can stack them to create a multilevel display unit. What size is each cube in the set?